In the final leg of his Cape Town campaign trail, ANC Secretary-General Ace Magashule visited a church in Philippi on Sunday. He used political rhetoric instead of tackling core issues such as youth unemployment, water and sanitation. 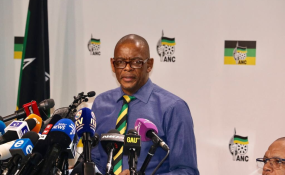 Ace Magashule concluded his two-day Western Cape weekend campaign trail at Apostle Mohlala ministries, part of Shekainah healing ministries, in Philippi on Sunday 14 April, where nearly 500 congregants were present for the Sunday service. The ANC Secretary-General had intended to spend the rest of Sunday morning on door-to-door visits in Crossroads, Philippi, but changed his itinerary and went to Grabouw instead. His campaigning kicked off on Saturday 13 April with door-to-door visits. Magashule spoke to residents in areas including Philippi East, Phola Park and Marikana informal settlement. The Western Cape is the only province not governed by the ANC. However, Philippi is an ANC stronghold. Before Magashule's arrival at the Crossroads church on Sunday, BoyBoy Ntsuma, a caretaker who's been working at the church for just over a year, said politicians always deliver "empty promises". "He is just coming to promise the things that he is not gonna do," Ntsuma told Daily Maverick.